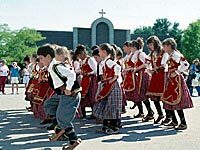 St. Sava’s Serbian Orthodox parish on Milwaukee’s south side sponsors several cultural groups, including the Junior Folklore Dance Ensemble. This group has over 70 members, children aged 6-13 who celebrate their Serbian heritage by dancing in traditional outfits. Slobada, a Serbian music group, provides live accompaniment. Their programs are performances that introduce others to Serbian dance, music and costumes. Weekends or weeknights. Willing to travel up to 180 miles.